A business simulation game is a form of experiential learning, or learning-by-doing. People learn, in a number of game rounds, to translate theory into practice. They learn how to use the theory to achieve measurable results. Does this mean that they need to have attended a training course first? No, not at all. By attending a business simulation with no preconceptions of the theory of “how to do it”, people learn as much as those who have attended training. Sometimes more. Are business simulation games only for IT? Again, no. Business simulation workshops like The Phoenix Project, allow those from the wider business to experience what IT experiences and learn how to build a closer working relationship with IT in a “safe” environment where everyone can try and fail, or try and succeed, without a business impact. A DevOps business simulation by Gaming Works This simulation is delivered by our esteemed partner James Gander of Gander Service Management. Business is demanding ever shorter release cycles for new applications. Traditionally ‘Operations’ is seen as a barrier with lengthy bureaucratic controls and delays in provisioning production systems. DevOps is a growing movement for shortening development and deployment and integrating Development and Operations. However this requires a mindset shift, new behaviours and a cultural shift in both Development and Operations. Traditionally suspicious of each other, they must now work closely together. Yet many companies are struggling to adopt and deploy DevOps and how to change the culture. And that is why you need “The Phoenix Project” simulation game! 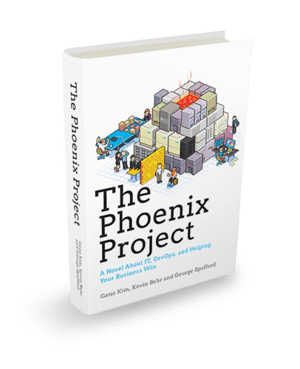 The simulation game is based upon ‘The Phoenix Project’ Book. The fictitious organisation, Parts Unlimited is in trouble. Newspaper reports reveal the poor financial performance of the organisation. The only way forward to not only save the co mpany but to make it competitive and profitable is “The Phoenix Project” which represents an IT enabled business transformation, with Retail Operations as the business owner of this project. The Head of IT Operations is asked to take the lead of the IT department and ensure that “The Phoenix Project” will be a success. But the Head of IT Operations is facing a tremendous amount of work. A huge backlogs of issues, features and projects. Your team will act in different roles within the Parts Unlimited organisation. You can be Retail Operations, Human Resources or Finance – playing the Business roles of the company. Or you can be the Head of IT Operations or other members from his IT Team that needs to develop the applications and solve the IT Issues.